Guava is native to tropical climates, and crops are successfully grown in California and Florida. The sweet fruit comes into its peak season during the fall and winter months with the final stretch of guava season at the start of the new year. The USDA recommends having 2 cups of fruits per day. If you are trying to regulate your blood sugar, knowing guava's carbohydrate content and glucose effect can be helpful. Guava contains 13 g of total carbohydrates per fruit of which 8 g is sugar. The remaining 5 g is from fiber. 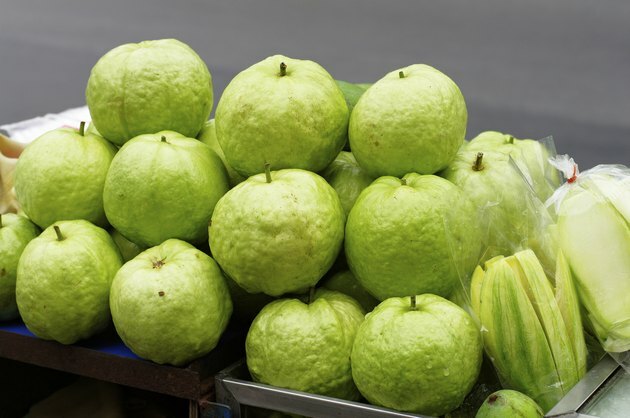 Along with the carbohydrates, guava contains 2 g of protein per fruit. Carbohydrates break down into glucose, which your body's cells use for energy. The glucose is delivered to your cells through your bloodstream. When you eat something that contains carbohydrates your blood glucose level increases as the carbohydrates are converted to glucose. The sugar content metabolizes quickly, reaching your bloodstream rapidly. The fiber content in guava reduces the digestion of carbohydrates. Fiber is not digested by the body but passes through without affecting your blood glucose. When you want to determine the actual carbohydrate effect of a food, reduce the grams of carbohydrates per serving by half of the dietary fiber grams if there are 5 grams or more per serving. The net carbohydrate count indicates the overall glucose reaction your body may experience. For example, guava contains 13 g of carbohydrates per serving. Subtract half of the 5 grams of dietary fiber, because the fiber content has no glucose effect. The net carbohydrates for a guava serving is10 g.
Adding 5 g or more of protein to a carbohydrate serving can slow your body's digestion, creating a gradual blood glucose reaction that helps reduce the occurrence of blood sugar highs. Add a lean protein serving such as soft cheese or salmon when you eat fresh fruits that contain natural sugar such as guava to reduce the overall carbohydrate effect. Will Blueberries Raise My Blood Sugar?